Where to Buy Food Grade Soy Lecithin? Chances are, you won’t find plain soy lecithin in your local supermarket. When looking to purchase soy lecithin locally, your best bets are health food and vitamin/supplement stores (such as GNC or The Vitamin Shoppe). 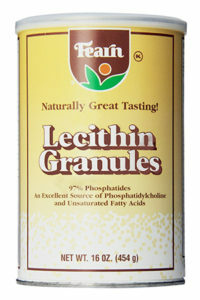 It is commonly sold in capsule form, as well as “Lecithin Granules” or “Liquid Lecithin”. There may be similarly labeled products, such as “Sunflower Lecithin”, that aren’t the same thing or products that include other ingredients – so be sure to check the label to make sure you are purchasing the correct product. You can also purchase food grade soy lecithin online in a range of quantities and forms – from 8oz bottles of liquid to 44lb sacks of granules. It is often easier to find Non-GMO varieties online than in-store. If you have ever read an ingredient list, there is a good chance that you came across the ingredient called soy lecithin. It is one of the most common ingredients found in our food supply. You can find it in everything from salad dressing to chocolate. Mostly commonly, it is used as an emulsifier. Depending on the manufacturer, it is typically 35% soybean oil and 16% phosphatidylcholine. The rest of the ingredients are other glycolipids and phosopholipids, which are commonly found in liver and egg yolks. It is derived from the waste product of soybean plants during processing. If you have opted to live an organic lifestyle, it is important to remember most soy grown is genetically modified unless specifically labeled organic. Soy lecithin is contains emulsification properties. It is able to keep ingredients together, such as a candy bar, by ensuring ingredients don’t separate. For example, it could cause oil and water to mix. It is even used in chocolate to keep the cocoa and cocoa butter together. By doing so, it gives chocolate the smooth, creamy texture that is so loved. Another use is in baking to keep dough from sticking and helping the rising process. Sometimes, it is added to baking mixes to allow water to be added easier without lumps in the batter. In addition, soy lecithin helps to stabilize emulsions, and this extends the shelf life of food. Soy is very cheap, so manufactures opt to utilize it to save money. Many people try to avoid soy in all forms, including soy lecithin. This is either because it is genetically modified, contains pesticides, and the harmful effects of soy. Another concern for people is that many are allergic to soy making soy lecithin off limits. Lecithin itself is found in other foods such as egg yolks, liver, canola oil, and peanuts. Despite these concerns, the FDA has deemed this to be a safe food additive. Be the first to comment on "Soy Lecithin"